Having had several beers from Unibroue and quite frankly they have all been superb beers, so as you can guess I’m pretty excited about this one. 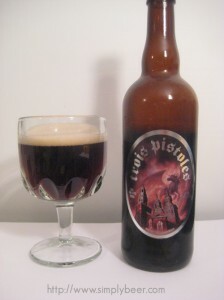 The Unibroue Trois Pistoles is considered to be a Belgian style Strong Dark Ale, at 9% abv i think it part way there. Beer pours a pretty evenly in a goblet with a good half inch head. A dark Mahogany color with a nice ruby hue. Fairly good head retention. This beer had a very strong characteristics. The dominate aroma was cherry and spice, sightly earthy. It was a delightful sweetness, I just kept smelling it. This was zesty and dry. Dark malt and bread were the initial flavors followed by clove and spice, finishing with a Zing of alcohol. Loved drinking this beer, it was very complex. Each sip highlighted a different flavor. The alcohol definately stood out, but it blended with the other strong flavors. This would go extremely well with a porterhouse or thick strip steak. It would also pair well with smoked cheese. Nice review, this was my first brew from Unibroue and it’s still one of my all time favorites. I find it thick and malty, complex, slightly fruity and completely satisfying, especially on a cold day.